Hey, I’ve noticed that Borders is kind of a big chain, and that if a book is on the bargain rack at my local store it will probably also be on the bargain rack in Oklahoma City, Poughkeepsie, and Macon. 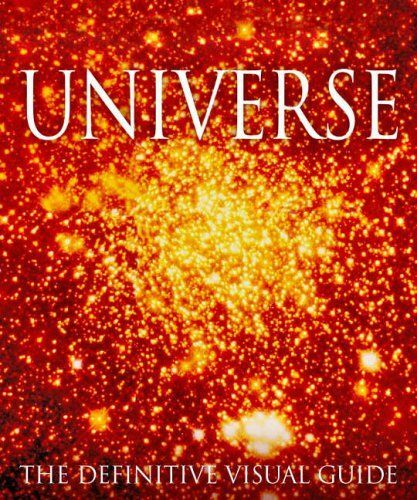 So check this out: Universe: The Definitive Visual Guide, from Dorling Kindersley, is available in hardback on the bargain rack at Borders for $9.99. The book does a pretty respectable job of fulfilling its titular promise. If you’re only familiar with DK books as skinny offerings aimed at children, prepare to be blown away. This bad boy is 512 pages long and weighs about as much as my favorite telescope (no, really). I’d list all the things it covers but we’d all be old before I was half through. There is a 111-page “Introduction” that covers everything from atoms to the birth and death of the universe, sky motions, ancient astronomy, space exploration–basically all the stuff about how we know what we know. The meat of the book is the 210-page “Guide to the Universe” that runs through the solar system, deep sky objects within the Milky Way, galaxies, and so on out to superclusters of galaxies and the large-scale structure of, what else, the universe (clue’s in the title). The book concludes with a 160-page section on “The Night Sky”, with constellation diagrams and seasonal star charts; this section alone is the equal or superior of many stand alone sky guides that cost two or three times as much as this whole volume. DK also nailed the “visual” part of their Ultimate Visual Guide. Every single page is covered in so many color pictures that you hardly know what to look at first. Most publishers would have screwed this up, and either used a bunch of stale recycled clip art or so crowded the pages with photos that there was no room left for content. Not so here: Universe is jam-packed with both photos and text and much of it is fresh and all of it is absorbing. Astronomy books are a lot like dinosaur books: after a while you only pick them up to check out the art and see if there’s even 10% that isn’t already familiar. Yes, Saturn’s rings are surprisingly thin and globular clusters are full of old stars; what else is new? But I have learned a ton just in the two or three days I’ve had Universe, about everything from Renaissance astronomers to sunquakes to lesser-known features of Mars to the orbit of halo stars around the core of the Milky Way. Really, seriously, if you’ve got ten bucks and you are at all interested in astronomy, even a little bit, go buy this book. I have a two-foot shelf of astronomy books and I’d have a hard time pointing to one that does any of the things that Universe does as beautifully and as well, and I am confident in saying that there is no book that does all of them so well. Get it while it’s cheap! Based on your (old) recommendation, I just bought a version of this book. Absolutely amazing! It’s a shame it has been put away until my birthday!